Paeonia The Fawn is hot! Not only because of its intense pink colour and the many dots on its petals, but also because, of all pale pink full-petalled peonies, it has the most features in common with Sarah Bernhardt. In our opinion though The Fawn is even more beautiful! The fiery red stems are thicker, the leaves are darker and stronger and the colour is even brighter. Moreover the flowers, when still in bud stage, are a bit bigger. 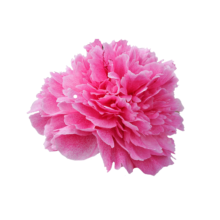 The Fawn is a full-petalled peony with large, pink flowers that start to bloom late in peony season. The leaves and the bud have a dark purple colour, even before the flowers themselves start colouring. The dots on the petals are icing on the cake. A special peony and a true favourite of many! This peony variety was by B.B. Wright. Unfortunately, it is unknown when exactly it has been bred. As a cut flower, The Fawn is fairly new and exclusive. The Fawn will only start to open up when it shows a bit of colour. It shares this typical characteristic with Sarah Bernhardt. Buy it at the right maturity to be able to fully enjoy this peony.